Habit Psychology is an amazing study. We all have bad habits that we would like to break, but it seems like an impossibility to change them. Day after day, week after week, year after year, we struggle with the same habits over and over. For years I endeavored to find a solution. I tried to create new habits to replace the bad ones. I used willpower to do the new routine for 21 days, the magic number for success. The new habit would go well for awhile, but ultimately fail. Usually about 30 days out, the routine would peter out and ultimately be forgotten. What I didn’t realize at the time, was that I was doomed to fail. I had believed a couple of lies about habits that led to frustration and ultimately failure. The bad news: most people will continue on with bad habits in the new year. They will make a resolution to change, maybe even set a few goals, but after three or four weeks, they will be back to the same old routine again. At the beginning of every new year, millions of people around the world set New Year resolutions. 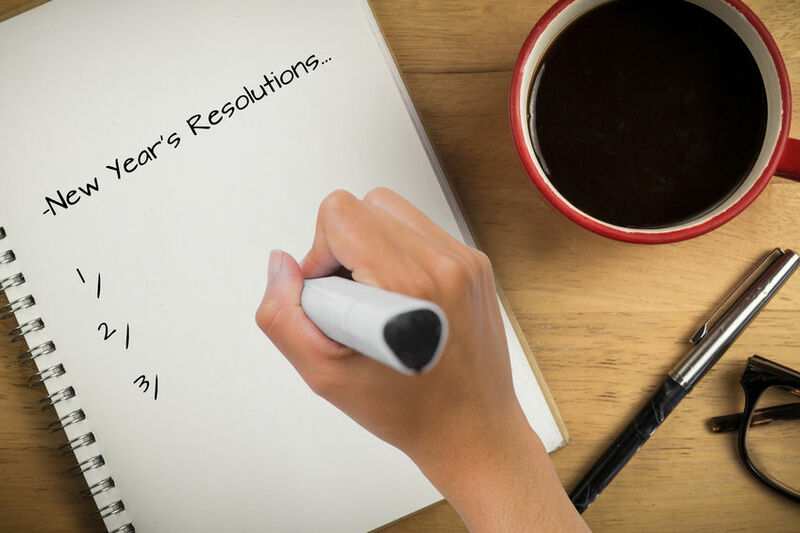 They have great intentions, but within weeks, these resolutions fall by the wayside. By the end of March, almost everyone has given up. Why is this? Resolutions are basically dreams. You want to do something new. Make changes in your life. Lose weight, take up exercise, eat better. As a person who has set mental resolutions year after year, only to see them fail every time, I have one answer. Resolutions don’t work. So if resolutions don’t work, surely setting a goal will work. In its most basic form, setting a goal is taking a dream (resolution) and writing it down. So if I write down a goal, surely this will help me follow through to success. In most cases no. While writing down a goal can help you move forward, the real truth is most written goals are abandoned after a few weeks. Simply writing down, I want to lose ten pounds isn’t going to provide the action steps necessary for personal success. Habits are tricky things. Many of the activities we do every day are because of ingrained habits. In many cases we don’t even realize we are doing them. Good or bad, we do them almost automatically. This is where the real power of habit change comes in. Knowing how they work will empower us to change them for the better. Routine: The course of action we take after the trigger to get the reward. Example: You get in the car in the morning (Trigger), You turn on the radio (Routine) to enjoy music on your drive to work (Reward). Now that we have seen some triggers, let’s look at three important facts about habits and see how they work. 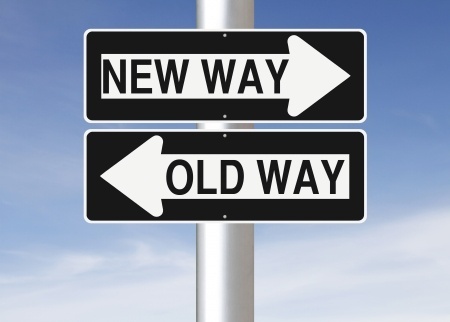 Researchers have found that it is much easier to change an existing habit than create a new one. With just these three simple pieces of data we can construct a system that let’s us maximize an existing habit or routine. Write a blended routine including your optimized routine and added habit. So let’s blend-up a couple of examples. Existing Routine: Turn on the radio and listen to music. Added Routine: Make one sales call when you get in the car. Positive action statement: When getting in the car in the morning, I will make one important bluetooth sales call and then listen to engaging business oriented audio books. Positive Action Statement: When going to Starbucks I will talk with people in line while waiting for a hot coffee. Modifications: Found that I missed the whipped cream on top of my drink. 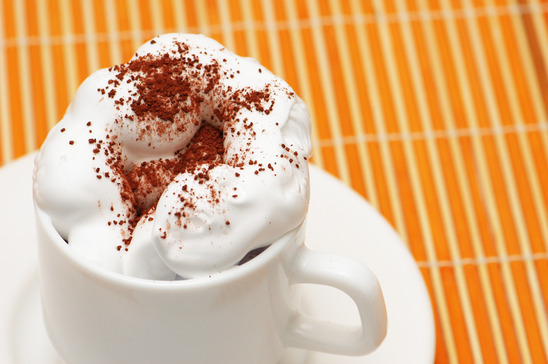 Started ordering black coffee with whipped topping and added cinnamon to make a delicious drink with only 15 more calories. Found it was easier to build a conversation if I had a business card, book, or other item with me. New Blended Statement: When going to Starbucks I will engage in interesting conversation with people in line while waiting for delicious hot coffee with whipped cream and cinnamon. Change Your Life: This new blended habit system is easy to follow with my TRIM Goals Plan. 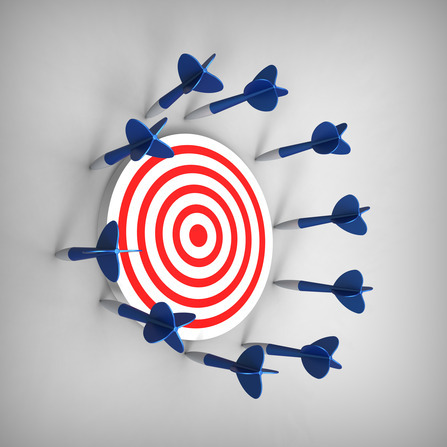 Outcomes: Maximize your existing triggers and add new ones. Easy to create routines that lead to success. 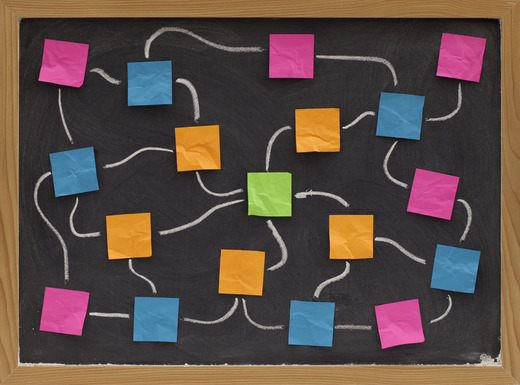 Why does goal setting have to be so complicated? You just want to accomplish a relatively simple goal like weight loss, but then it gets real complicated. You suddenly have to track calories, look at fat grams, watch everything you eat, exercise multiple times a day, go to the gym on a revolving schedule, input your progress in a phone app, and generally set yourself up for failure. I’ve tried to disprove this simple statement for years, yet every time I think I’ve got a new solution, it fails. I can come up with great and detailed goals with action plans, worksheets, and colorful graphs, but the more complicated it is the quicker I give it up. That’s not to say I haven’t reached success. But here is the kicker. If I want to accomplish a major goal. I need to bring in other people. That may be a coach, a team, or a crowdsourced resource. They provide insight and motivation to help me get it done. Those type of major IMPACT goals we’ll look at in a different post. I have a simple plan for you. It’s based around my idea of SMARTER Goals. I just trimmed the acronym down and made it as easy to follow as possible, while adding an additional tweak that makes them more powerful. The routine is the current action sequence that follows the trigger. The mix is just combining our basic routine with a small new habit. So let’s take a quick look how this will work with our four examples above. Getting in the car: Currently you get in the car and turn on the radio every morning on your commute to work. Something that most people do on a daily basis if you drive. Enjoyable, but not very productive. You optimize the existing routine by listening to audio books instead of the radio. Then you add a small new habit of making a sales call via bluetooth. You blend the combined routine so it works for you. 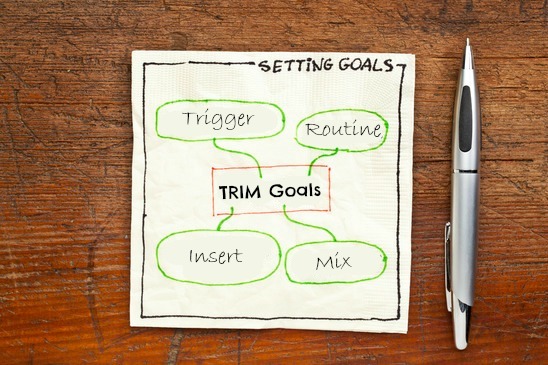 You just write out the new routine in a positive manner… a TRIM Goal is created. I will make an initial sales call and then listen to productive audio books when I get in the car every morning. Going to Starbucks: Currently you go to Starbucks on your way to work and order a 600 calorie Grande Latte. You decide a rather painless way to lose weight is to modify this routine and replace the Latte with a green tea, which has no calories. You also decide you would like to meet new people, so you tag on a small new goal of talking to someone new each time you go to Starbucks. You blend the new routine so it works for you and write it out in a positive manner. I will enjoy a delicious green tea every morning at Starbucks and chat with someone new while waiting in line. Coming home from work: Currently you get home tired from the day and sit in front of the TV for an hour before dinner. You decide that you really want to make this routine more productive by writing a book. You also decide that you want to improve the relationship with your wife, so you create a new small habit of kissing her when you get home. You blend the new routine so it works for you and write it out in a positive manner. I will kiss my wife when I get home from work and write at least 500 words in my new book before dinner. Brushing your teeth: This is something you do before bed every night. It’s a habit, but unfortunately you only brush for 10 seconds. You modify the routine by buying a new electric toothbrush that has a 90 second timer on it. Then you add a very small routine of flossing 5 teeth. Each time you floss you do different teeth. You blend the new routine so it works for you and write it out in a positive manner. I will use my new power toothbrush every night before bed and floss five teeth. So as you can see we have quickly setup some TRIM goals and written them out. This type of goal is easy to setup if you start with some of your existing routines first and then decide on doable modifications and small new habits. Keep the changes small and you’ll find they are really easy to implement. Maximize and Monitor: Once you have your new goals written out, spend a few days testing them and see if you can make small tweaks to maximize their effectiveness. Once they are working smoothly, monitor them for a few days to make sure they become ingrained habits. Since they are based on current routines, they are not hard to change and the new small habit is easy to add. The key here is to keep things simple. Reap the Results: If you were to simply implement the four TRIM Goals above, in the period of one month (four weeks) you would have listened to eight audio books (20 min commute), made twenty sales calls, lost four pounds, made a handful of new acquaintances, have 10,000 words towards your new book, a happier spouse, cleaner teeth, and a lot less unused floss lying around. All with little pain or fuss and few willpower struggles. The nice thing is, after a month of doing these new routines, these have become ingrained habits that will keep on leading you to success, month after month. 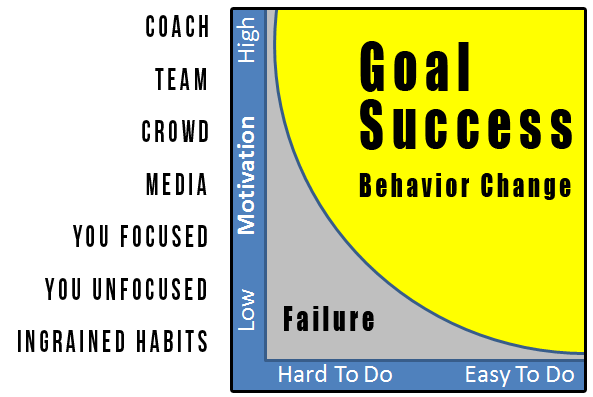 Why is goal motivation so hard? 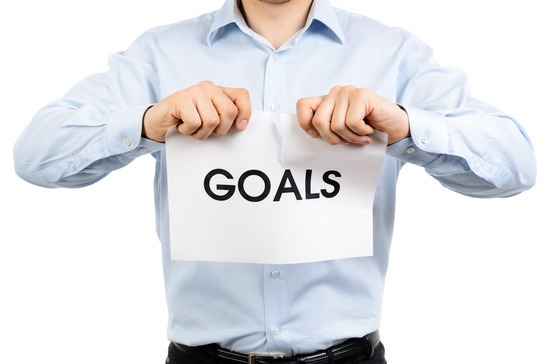 I’ve been setting goals for years and have written about goal setting extensively. I’ve also written and published an eBook on goal setting, but through it all I have had one nagging problem. Goal setting only worked part of the time. I’ve had some amazing, almost impossible goals come to fruition. Yet I’ve had very straightforward SMART goals, laid out to the tee, fail miserably. I’ve also had very simple goals work like a charm, but others seemingly easy ones fail in just a few days. It always seemed to me that really hard goals worked, and also very simple ones. It was the ones in the middle, the well planned out ones, with a complete plan, that crashed and burned. It wasn’t until I ran into some goal setting research by Stanford professor, Dr. B. J. Fogg that things started to make sense. Once he put up a graph it all clicked. This simple visual showed me clearly what I had experienced for years. The middle grey area is the tricky part. If we set a goal to do something very difficult and don’t have enough motivation, we will fail. Conversely, if we have a lot of motivation, but an unchallenging task, we will fail too. This is exactly what I have experienced in my life. When I have worked with a coach or other motivator on really tough challenges I have seen incredible success. Here is a short list of some goal motivation successes I have experienced. Changed from drinking sugary soda to unsweetened iced tea. Changed from listening to the radio while commuting to audio books. Changed from using an ATM card to using cash. Saved considerable money over time. Deposited a small amount in to savings from each paycheck. Here are some of my goal failures. Great intentions, yet in the grey area. I wish I would have had this graph and knowledge years ago. I have wasted considerable time and effort in my life in the grey area. With just some simple tweaks almost everything on my failure list could either have been avoided or modified for success. Personally this graph is one of the most enlightening tools I’ve run into in my eight years of blogging. It answers a lot of questions I’ve had and will ultimately help me make better decisions. 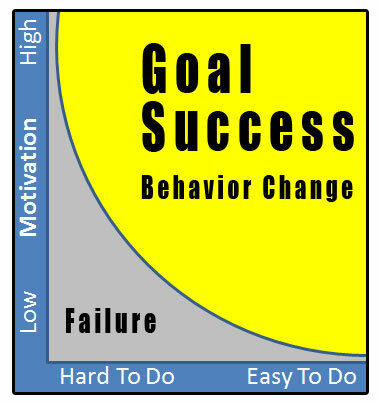 Tomorrow we’ll look at a powerful Motivation gradient and see how it can be plotted accurately in this graph. The resulting chart will allow us to accurately set goals and ultimately plan out our success. Stay tuned.